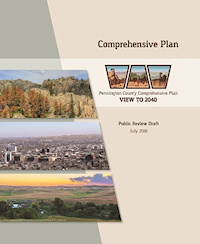 to the Pennington County Comprehensive Plan update website, your “View to 2040”. Pennington County, located in the western portion of South Dakota, is steeped in history, blessed with natural and historic resources, and is a land of many opportunities. The county is also an area of diverse landscapes, consisting of the rugged terrain of the Black Hills on the west, the growing urban areas in and near Rapid City near the center of the county, and to the rolling prairies and Badlands on the eastern side. How can Pennington County preserve its heritage and accomodate the changes that are desired for the future? That is one of many questions that will be explored as part of the process of updating Pennington County’s Comprehensive Plan. A Comprehensive Plan is a community’s roadmap to the future. It’s a 20+ year visionary document that helps guide all aspects of the community, including topics like transportation, economic growth, public facilities, and natural resources.